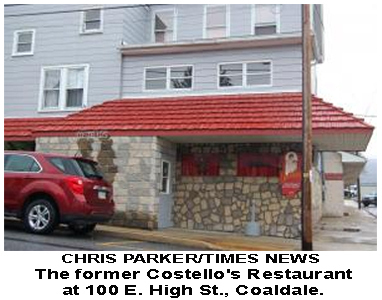 Coaldale, Pennsylvania - April 29, 2011 - We regret to inform you that Costello's Restaurant, located at 100 E High St, Coaldale, PA has closed earlier this year. After serving the community for over 70 years, it was a tough decision to retire from the restaurant business. We would like to thank the many patrons throughout the years that have supported this fine establishment for all their family dining and banquet hall needs. 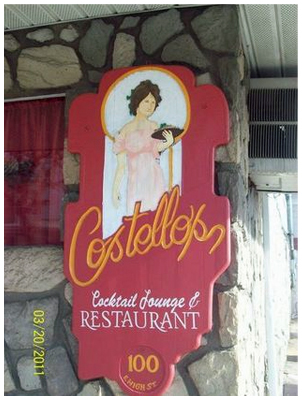 Costello's Restaurant specialized in customizing banquets, weddings, and business meetings, while serving as a local restaurant and bar. A longtime Coaldale landmark is on the auction block. Costello's restaurant, at 100 E. High St., and its equipment and supplies, will be auctioned at 9 a.m. May 28 by Arner Auctioneers. Other items, including antiques, furniture, household goods and tools, from the living quarters above the restaurant, will be auctioned at 9 a.m. May 21, according to notices on Arner's website. The auctions will be held rain or shine. If it rains, the sale will be held indoors. Bidders are asked to bring chairs, and the terms call for cash or Pennsylvania checks. No out-of-state checks will be honored. For more information, access the sale on Arner's website at www.arnerauctioneer.com and click on "auction ads" on the right side of the screen. Owned by Stanley Costello Sr. and his wife, Ann, the restaurant was the spot for awards banquets, funeral dinners, wedding receptions and other celebratory dinners, as well as a popular dinner venue. Costello's was known for its seafood dishes. The Friday night seafood buffet was a popular draw. Costello Sr. was known for his outgoing, friendly nature  and for his musical talent. Costello had learned to play the violin as a young lad, and often played for his restaurant guests' enjoyment, as well as events at Ss. Peter and Paul's Church in Lansford. Coaldale resident Bob Ames was a longtime Costello's customer. He hopes someone will buy the restaurant to keep it open. 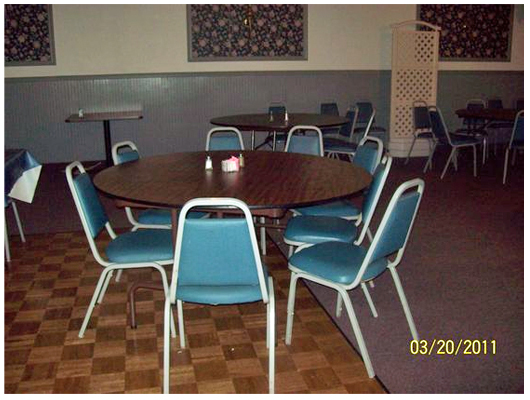 "We used to have a lot of our Republican dinners and gatherings there. It was always a very family-type place. It was so convenient here in town, and it had a very pleasant atmosphere. It was a neighborhood restaurant  you'd go in and you'd always see someone you knew. It's going to be missed," he said. Costello's father, Joseph, bought the site of the restaurant in the early 1920s, intending to turn it into a bar. But he died in 1932  a year before prohibition ended. Joseph's wife, the former Anna Harmenick, was left with seven children to support. She applied for a liquor license, and the rest is history. Stanley Costello Sr., who had earned a Purple Heart during his service in Germany during World War II, and his wife, the former Ann Kidda, returned to Coaldale seven months after the war ended to help Costello's mother operate the bar. In 1948, Costello expanded the bar and in 1950, began the restaurant operation. The couple went on to have three children  Stanley Jr., Lillian and Marianne. Costello's mother passed away in 1962, and Stanley and Ann continued the business, nurturing it to success. Costello, then age 90, said in an April, 2009 interview with the TIMES NEWS that he credited Ann  and her love, devotion and fine cooking  for the restaurant's success and for his own good health. But the restaurant closed earlier this year. Efforts to reach Costello Sr., his son, Stanley Jr. and his wife, Angela, who was the restaurant's president, stockholder, director and secretary, according to Pennsylvania Liquor Control Board records, were unsuccessful. 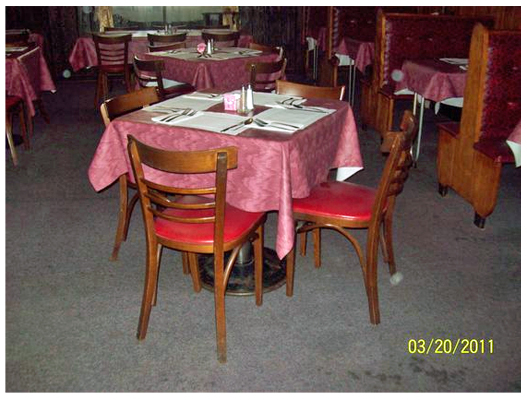 The restaurant was recently listed by real estate sales companies. 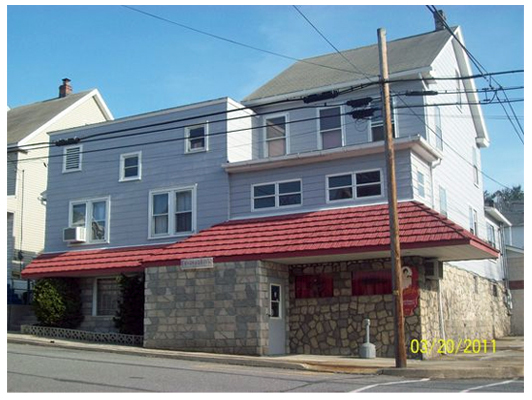 According to the Prudential website, its asking price was $299,000. The Weichert Realty website described the restaurant as 6,900 square feet, with oil heat and central air conditioning. The website also says the building dates to 1900, with a banquet hall added in 1991. A West Penn Township tavern owner on Saturday offered the sole bid $30,000 for the landmark Costello's restaurant at 100 E. High St., Coaldale. Bob Carnes, who owns the Clamtown Tavern, offered the sole bid for the restaurant at an auction held Saturday. But Carnes as of early Wednesday had yet to hear whether the Costello family would accept the bid. Efforts to reach Costello family members were unsuccessful. If they do accept his bid, Carnes said, he'll keep the restaurant and its bar open, and would even consider keeping the Costello name, if the family agrees. "I'm very excited, very happy, if this goes through," Carnes said. 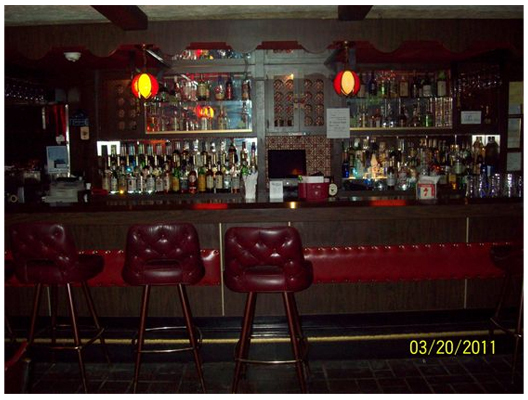 He said he would transfer the liquor license first thing in order to open the bar immediately. Carnes on Saturday bought most of the restaurant's equipment, furniture and supplies. Some of the items, including fryers, grills and broilers, will be used for the Clamtown Tavern's new restaurant, set to open Thursday. "I didn't go there to buy the building. I went there to buy equipment for my restaurant," he said. "But I love the history of the place, and I have the background and the people to make it happen." Among the items Carnes bought for pennies on the dollar were boxes of Costello's menus. "Their menu is very, very similar to ours," he said. Both feature fresh cut steaks and seafood. He's owned the Clamtown Tavern for three years and seven months, he said. 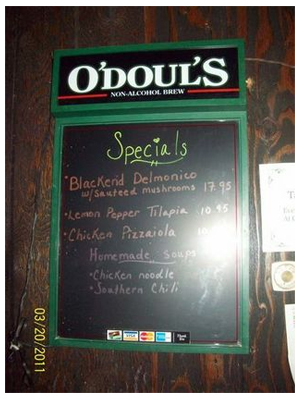 Carnes said that if he does become the new owner, he has no immediate plans to change anything at Costello's. "The place is gorgeous," he said. Arner Auctioneers offered the restaurant at noon Saturday, near the end of the sale, which began at 9 a.m. The auction drew a good crowd, some of whom were clearly in the restaurant business and bid hard for the boxes of dishes, utensils, stock pots, baking pans, table candles, servers, warming trays, coffee makers and other equipment. The bidding for the restaurant itself started at $250,000. With no offers, the price quickly plummeted to $40,000. That's when Carnes, who stood surrounded by cardboard boxes of cups and saucers, pots and pans, offered the $30,000. On May 21, Arner's auctioned off the contents of the apartments above the restaurant, where Stanley Costello Sr. and his wife Ann, lived. At that auction, Carnes bought the original cash register, built for restaurant founder Joseph Costello, on April 17, 1926. The restaurant took root when Stanley Costello Sr.'s father, Joseph, bought the property in the early 1920s, intending to turn it into a bar. But Joseph Costello died in 1932, a year before prohibition ended. Anna Costello, with seven children to support and determined to fulfill her late husband's dream, applied for a liquor license. Eventually, her son Stanley Jr., an outgoing and musically gifted young man who played the violin for his customers, took over the tavern. He expanded the bar in 1948, and two years later, opened the restaurant, which became famous for its seafood and was the popular venue for wedding receptions and other gatherings. Ann Costello died in 1962. Stanley Sr., now in his early 90s, lives in a local care home. The restaurant operation was passed on to Stanley Jr. and his wife, Angela, who was the restaurant's president, stockholder, director and secretary, according to Pennsylvania Liquor Control Board records. Costello's closed early this year. Stanley J. Costello, 95, formerly of Coaldale, entered into eternal rest Thursday, Feb. 27, 2014 in Hometown Nursing and Rehabilitation Center, Tamaqua. He was the husband of the late Anna N (Kidda) Costello who passed away June 8, 2011. Born in Coaldale, he was the son of the late Jozel Kasztelan and Anna (Hamernik) Costello. He was self employed as an owner/operator of Costello's Restaurant in Coaldale for 75 years until retiring in 2010. Stanley also sold insurance for the Polish National Alliance for many years. He was a United States Army veteran serving during World War II with the Troop B 1013 Calvary Squadron in Normandy, Northern France, and Poland. He received the Purple Heart. He was a graduate of McCain School of Business. He was a member of the former Ss. Peter and Paul's Catholic Church and a current member of St. Katharine Drexel Catholic Church, Lansford. He was also a lifetime member of the Coaldale American Legion, the Coaldale Fire Company, the Lansford AMVETS and the Coaldale VFW. 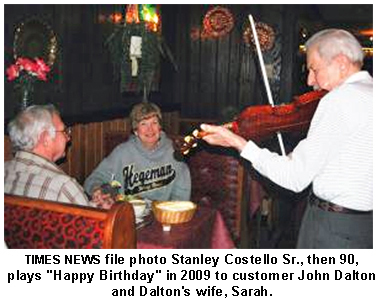 Stanley was well known for playing the violin for customers on their birthdays, anniversaries and many other special occasions. Surviving are daughters, Marianne, wife of Larry Crampsie of Allentown; and Lillian Rose Costello of Pottsville; a son, Stanley Jr. and his wife, Angela of Lansford; grandchildren, Lauren (Crampsie) and her husband, Jason Lotkowictz of New York City, N.Y., Alexandra Valusek , and Anthony Costello both of Lansford; and a great grandson, Drake Lotkowictz. He was also preceded in death by sons, John and Paul Costello. Services: Funeral services 10:30 a.m. Wednesday, March 5, at the Sverchek-Blazosky Funeral Home, 340 E. Bertsch St., Lansford followed by a Mass of Christian Burial at 11 a.m. in St. Katharine Drexel Catholic Church, Lansford with the Rev. K.A. Medve officiating. Interment will be held in Ss. Peter and Paul's Cemetery, Summit Hill. Call Tuesday at 6 to 8 p.m. and Wednesday morning from 9:30 a.m. until the time of services in the funeral home. Donations may be made in his name to the Eastern Pennsylvania Down Syndrome, 6900 Hamilton Boulevard, P.O. 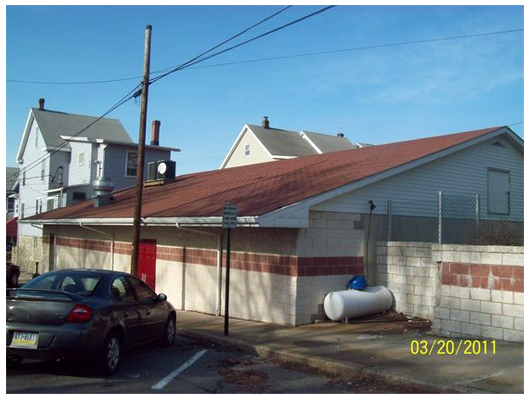 Box 60, Trexlertown, Pa. 18087. The Sverchek-Blazosky Funeral Home has been entrusted with the funeral arrangements. Mrs. Anna N. Costello, 92, of Pottsville, died Wednesday, June 8, 2011, in her home. She was the wife of Stanley J. Costello, who she married in 1947. She and her husband co-owned and operated Costello's Restaurant, Coaldale. Previously, she had been employed as a beautician in Lansford. Born in Coaldale, she was a daughter of the late John and Eva (Gyiman) Kidda. She was a member of St. Katherine Drexel Catholic Church, Lansford. A graduate of Tamaqua High School, she also attended cosmetology and beautician school in Philadelphia. A former Cub Scout Den Mother, she was a volunteer with the March of Dimes and an officer for the Coaldale Little League CHOSE organization. Surviving, in addition to her husband, are a son, Stanley Jr., and his wife, Angela, of Lansford; two daughters, Marianne, wife of John Crampsie of Allentown and Lillian Rose Costello of Pottsville; three grandchildren, Lauren Crampsie and her husband, Jason Lotkowitctz of New York City, N.Y., Alexandra Balusek and Anthony Costello, both of Lansford; a brother, William Kidda of Edison, N.J., and his wife, Ceil; nieces and nephews. She was also preceded in death by two sons, John and Paul Costello; a brother, John Kidda; and a sister, Mary Sourman. Service: Mass of Christian Burial 11 a.m., Saturday, St. Katherine Drexel Catholic Church, Lansford, with the Rev. Kenneth Medve officiating. Interment, SS. Peter and Paul Cemetery, Summit Hill. Call 6-8 p.m., Friday or 9:30-10:30 a.m. Saturday, August M. Gulla Funeral Home, 130 E. Ridge St., Coaldale. Prayer service 10:15 a.m. Saturday. Online registry at www.zrgfuneralhomes.com.